Thunderbirds first screened on the ITV Network in 1965, and 2015 sees the series celebrate its 50th annversary. 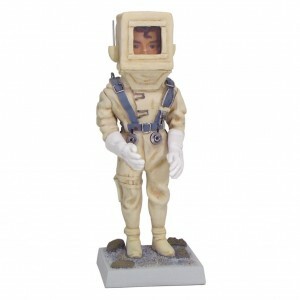 The series was created by Gerry and Sylvia Anderson, and filmed by their production company AP Films (APF) and distributed by ITC Entertainment. The first Thunderbirds collectables and books appeared in 1966 and we take a look at some of the highlights from the last 50 years, and their values and produce a small Thunderbirds collectables price guide. Pictured: Thunderbirds Annuals from 1966 and 1971. The first Thunderbirds annual appeared in 1966 with editions in 1967-1970 and 1971 & 1972. 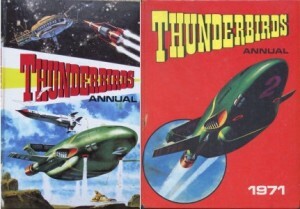 There have also been annuals in the 1990s and more recently with the Thunderbirds film and new TV series. In excellent condition early annuals are valued at £25-£35 each. Condition is everything, in lesser conditions annuals can be just a few pounds each.
. One of the most popular characters is Lady Penelope actually appeared first in the TV21 annual of 1965. Thunderbirds is set in the mid-2060s and followed the exploits of International Rescue (IR), a life-saving organisation equipped with technologically-advanced land, sea, air and space rescue craft; these are headed by a fleet of five vehicles named the Thunderbirds and launched from IR’s secret base in the Pacific Ocean. 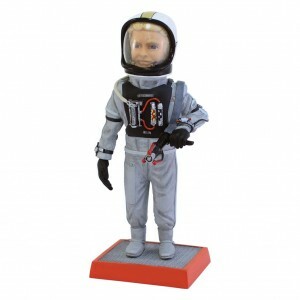 The main characters are ex-astronaut Jeff Tracy, the founder of IR, and his five adult sons – Scott, John, Virgil, Gordon and Alan, who pilot the Thunderbird ships. 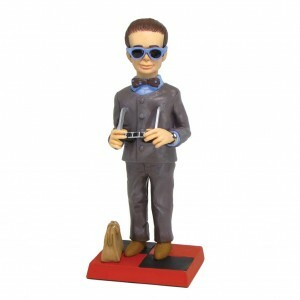 Other main characters included Lady Penelope and Brains. Pictured: A Dinky No.100 “Thunderbirds” – Lady Penelope’s FAB1 – pink, clear roof slides, gold interior with “Lady Penelope & Parker” figures, cast detailed hubs – comes with missiles and harpoons in bag – overall condition appears to be generally Near Mint, still a superb example in a Near Mint bubble pack. Sold for £360 at Vectis, August 2015. Image Copyright Vectis. As with all die-cast models condition is everything and this is a very good example. There have been several versions over the years of this classic and Corgi are releasing a 50th Anniversary version – click for more details. It was the fourth Supermarionation puppet TV series to be produced by APF. Previous shows included Four Feather Falls, Supercar, Fireball XL5 and Stingray. Supermarionation used a form of electronic marionette puppetry combined with scale model special effects sequences. 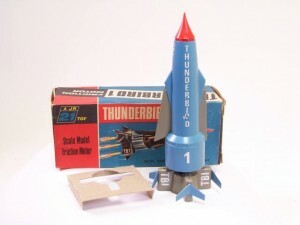 Thunderbird 1: a hypersonic rocket plane used for fast response and accident zone reconnaissance. Piloted by primary rescue co-ordinator Scott Tracy. Thunderbird 2: a supersonic carrier aircraft that transports rescue vehicles and equipment to accident zones in detachable capsules known as “Pods”. Piloted by Virgil. Thunderbird 3: a single-stage-to-orbit spacecraft. Piloted alternately by Alan and John, with Scott as co-pilot. Thunderbird 4: a utility submersible. Piloted by Gordon and normally launched from Thunderbird 2. 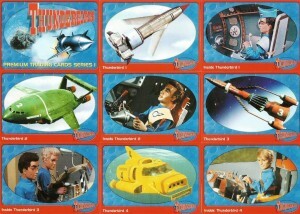 Thunderbird 5: a space station that relays distress calls from around the world. Manned alternately by “Space Monitors” John and Alan. 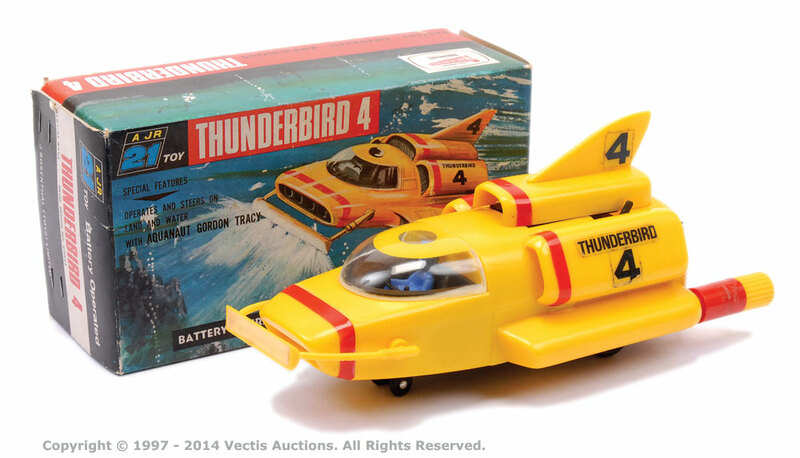 JR21 (named after managing director Jack Rosenthal) which later became Century 21 produced a range of toys featuring all the vehicles (Thunderbirds 1-5 and Lady Penelope’s FAB 1) in the show and some with variations. 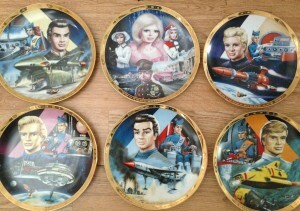 These JR21 and Century 21 toys have become collectables with models in boxes in very good condition fetching up to £300. Sold for £195 at ebay, Aug 2015. Sold for £300 at Vectis, Oct 2014. Sold for £70 at Vectis, July 2014. Sold for £130 at Vectis, Feb 2014. Robert Harrop have been producing Supermarionation and Thunderbirds models for a number of years and their reproductions have won many fans and plaudits. Robert Harrop started producing figures in 1986 with their initial range of Doggie People. They have made models of all the main characters, associated characters, models and scenes and have designed a range to celebrate the 50th anniversary. Below are a selection of the 50th anniversary models. 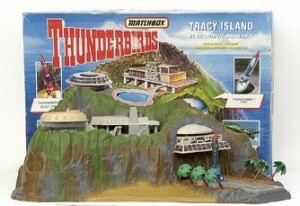 In 1992, Tracy Island became a phenomenon in the UK, after Thunderbirds was re-run on BBC2 and generated massive interest in Thunderbird related toys. 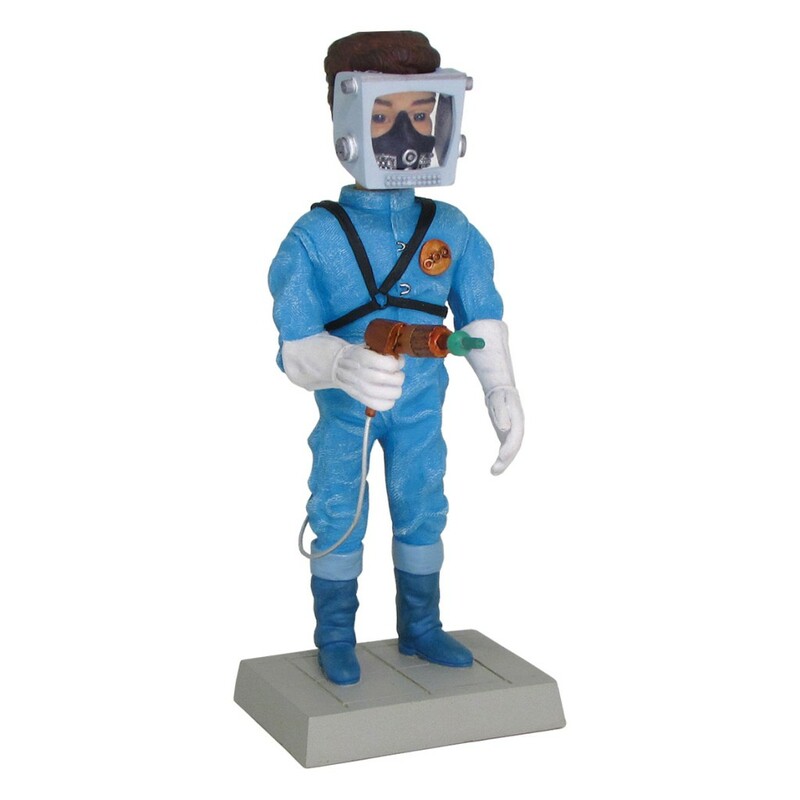 The Tracy Island playset was top of many Christmas lists but large demand resulted in a shortage that left many parents and children upset. Pictured: 1992 Matchbox Tracy Island. These now sell boxed from £40-£100. 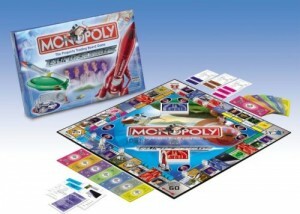 The story was reported in the national news and is cited as the archetypal mistake to be avoided by the toy industry in general during the Christmas shopping season. Blue Peter responded to the stock shortage by demonstrating how to build a home-made version. Another release of the series in 2000 also sparked a peak in interest and a new Tracy Island playset from Vivid Imaginations went on to become the best-selling toy of 2000. Blue Peter once again had an island building creation. 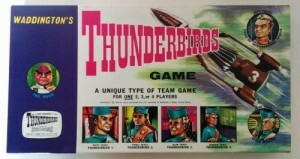 There have been many Thunderbirds advertising tie-ins, books, ephemera, models, puppets, coins and more produced over the years – too numerous too mention in a brief article. Below are a few we like here at WCN. 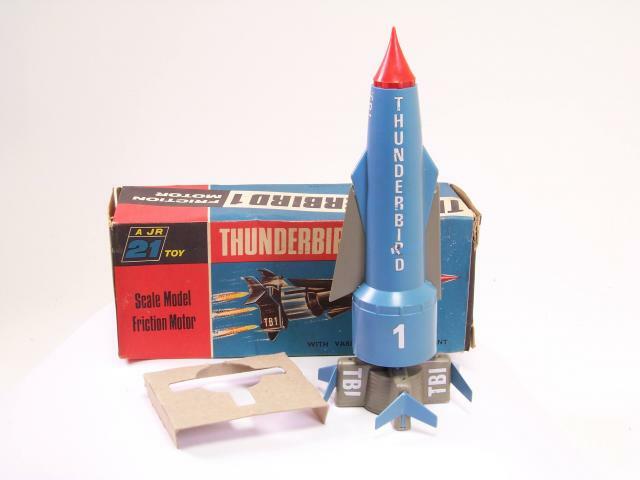 Thunderbirds Vintage Toys has some great information and many wonderful images of rare and unusual Thunderbirds merchandise – click to visit.